The Fossil Q Control is the first smartwatch from the fashion brand that aims to appeal to watch lovers while also smattering in some sports watch features. Wear watches that have launched under the Fossil umbrella so far have strongly focused on sticking to the company's fashion roots. Michael Kors, Diesel, Kate Spade. All of these brands have favoured attractive designs at the expense of giving us the full Wear experience, with mixed results. The Q Control does still follow the 'good looks first' blueprint, but hopes that by adding a heart rate monitor and a waterproof design with swim tracking support via third party apps, it should give it similar appeal to the Misfit Vapor. Misfit is of course part of Fossil now and its Vapor watch is clearly the inspiration for the Q Control. It has the same sports tracking features as the Vapor, which does mean built-in GPS is missing. But you do get activity tracking powered by Google Fit. Priced at $279, the Q Control though is more expensive than the Vapor ($199.99. So the question here is, what are you paying the extra money for? We've been getting to know the sporty Fossil Wear smartwatch to find out if the Q Control deserves to be on your wrist. So let's get the basics out of the way. The Q Control comes in two versions: an all-black model with a black silicone strap and a rose gold case version with a grey strap. Both have circular 45mm sizes cases measuring 14mm thick, and are water resistant up to 50 metres. So you can take it for a swim. Those 20mm straps are interchangeable too, letting you mix up styles using the simple pin mechanism on the back of the bands. 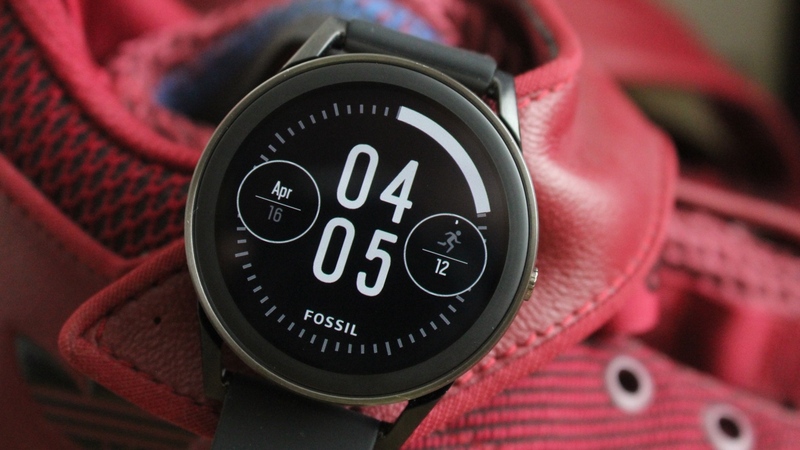 It's fair to guess that Fossil took one look at the Misfit Vapor, copied it, and made some minor design tweaks; put them side-by-side, most would struggle to see the difference. It has that same inoffensive, minimalist look that won't catch your eye like a Michael Kors or a Kate Spade Wear smartwatch will, but I'm sure people will appreciate that it goes about its business in a more subtle way. It has the one physical button the side of the watch and heart rate monitor around the back of the case. It also adopts the Vapor's touch bezel as an alternative method to navigate through watch screens. Like the Vapor though, I didn't find it all that useful, and there weren't any apps that take advantage of it to make it a worthwhile addition. At the heart of the Q Control is a 1.39-inch screen packing a 450 x 450 pixel resolution, which is certainly one of the design highlights. It's bright, colours are rich if a little oversaturated, and it provides those deep blacks that we've come to expect from OLED displays to help make it a solid smartwatch display. However the touchscreen doesn't stretch all the way to the edges of the bezel and touch responses can be temperamental when there are a lot of notifications or activity on the watch. Overall, I liked wearing the Q Control day-to-day. It was comfortable, it certainly didn't give me any skin irritations and it has all the hallmarks of a well built smartwatch. If I had the option, the rose gold version is the one I'd go for. With the right band combo to go with it, I think it could elevate the Q Control to be a more appealing smartwatch than the black option. Android Wear? What's that? It's all about Wear OS now that Google has rebranded its smartwatch operating system in that hope it can boost its popularity. Powering the Wear OS performance is Qualcomm's Snapdragon Wear 2100 processor alongside 768MB of RAM, which ensures swiping through those screens and launching apps doesn't show any signs of lag. As far as getting that full Wear OS experience, you get most of it, but there are some notable omissions like the lack of NFC. That means no Google Pay. There is however a microphone to ensure Google Assistant support is on board and the ability to do things like customize watch faces and download apps directly from the smartwatch. 4GB of onboard storage means you can store music for a more standalone smartwatch experience, but there's no LTE here like you can get on an Apple Watch or certain versions of Samsung's smartwatches. On the app front, all the usual native Google apps suspects are there (reminders, translate, weather etc) and Fossil's own contributions are pretty low key. In fact there's just one app from Fossil on there and it's not very useful. Fossil Q essentially lets you save customized watch faces into different categories. The watch faces Fossil does include are at least some of the most attractive we've used. It's just a shame there's not more of them. Wear OS still feels like a work in a progress than rival platforms and it feels weird saying that when it should be far more polished and robust by now. Notification support has at least improved greatly, but it still very much feels like an OS of parts, not one that runs together as one harmonious, intuitive operating system. The big draw of the Q Control should lie with its sports tracking features, although I'm not sure it's going to have a lot of luck doing that. This is no Garmin or Polar rival. There are some decent features on board here, but it simply doesn't do a great impression of a sports watch. Starting with the basics, it can double as an fitness tracker letting you count steps, measure distance covered and measure calories burned, though there's no sleep tracking (more on that later). These fitness tracker features are powered by Google Fit, but again don't feel well integrated into the whole smartwatch experience. There's no updates during the day and the onus is on the user to dip into the apps to check progress. Not ideal. It's a similar story with the one piece of dedicated fitness hardware that should help the Q Control stand out. There's no GPS tracking here (you have to use your phone) but you do have a heart rate monitor, which can be used for workouts and on the spot readings. Unfortunately it's a very similar experience to what I had with the Vapor. Taking on the spot readings is an irritatingly long process and during workouts it just doesn't serve up data that I'd be willing to trust for accuracy. Against the Polar H10, it could be as much as 10-15 BPM readings out. You can also swim with the Q Control, but unlike the Vapor you don't have the benefit of Misfit's software to track performance. Instead you're relying on third-party apps like MySwimPro, which is a great swimming app and well optimized for Wear, but it's the kind of app where you need to take your swimming really seriously to get the most out of it. Fossil says the Q Control should give you a day's worth of battery life and based on my experience that's pretty much what you expect. That does involve being economic with its most power hungry features (full screen brightness, sports tracking). A day and a half is possible, but you'll be staring down at a blank screen by the end of that second day without doubt. The all-day battery life is the main reason why you don't see any dedicated sleep tracking features here either. It's a relatively quick charger at least and will get you from 0-100% battery with the magnetic charging cradle one of the better I've used. The Fossil Q Control is the company's first sporty smartwatch and maybe it should be its last based. My advice: stick to what you're proving to be very good at. Focus on making Wear smartwatches more attractive and making features like Google Pay one of the first features on the specs list. Like the Misfit Vapor, it was nice to see Fossil branch out, but also like the Vapor, it didn't really pull it off.